Congratulations on your escape from the womb! 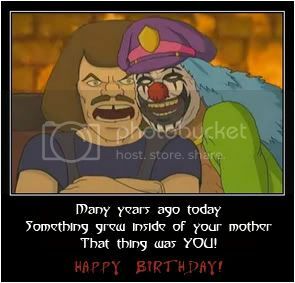 Happy Birthday Evil Red!!!! Hope it's a good one for ya. Happy b-day my little perverted friend/sister!!!!! Happy Birthday to you Red of the Evil. Happy birthday to one of the best gingerheaded living corpses I've ever known! it was great seeing you on your birthday, you looked freaking HOT, HOT, HOT!!!! Happy One Year Closer to Death Day!